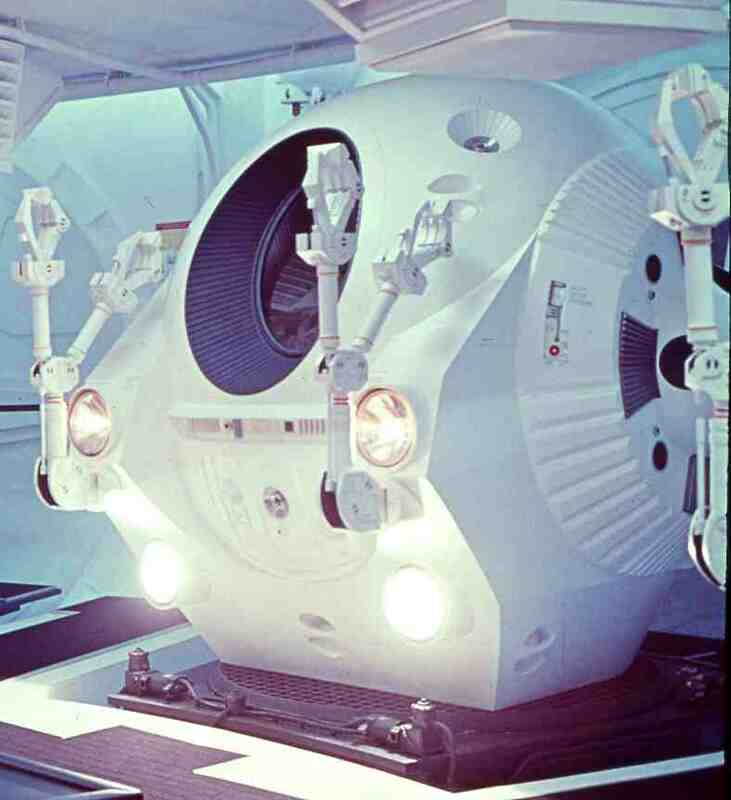 It is well known (Agel "Kubrick's 2001" c.1970) that there were 3 full size Pods built for the pod bay set, two had operational doors and mocked-up interiors. A fourth pod was built for filming the EVA rescue scene, and was full of servo motors and drive mechanisms for controlling the pod arms. 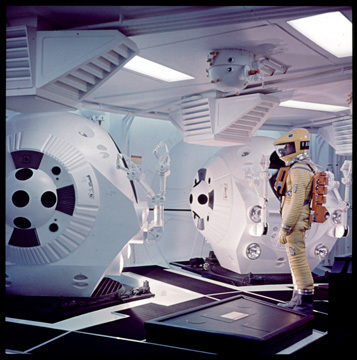 A separate interior Pod set was built for filming interior scenes. 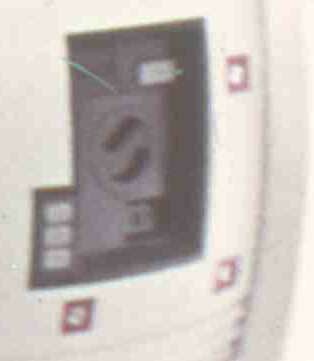 The image above, of Bowman in one of the pods, shows that at least one of the pods with a mocked-up interior had lighted overhead control panels in the pod. There are 3 versions of the pod one can make as a reproduction: 1) exterior only version, 2) interior only version (ie like a simulator), or 3) a full-up pod with interior. Of course if one was to do the interior, then it would have to have lighted switches, operating flat screens, etc... My plan is to make a complete pod with functioning interior. Ok, now that is easier said than done, since some parts of the pod design are not well understood. 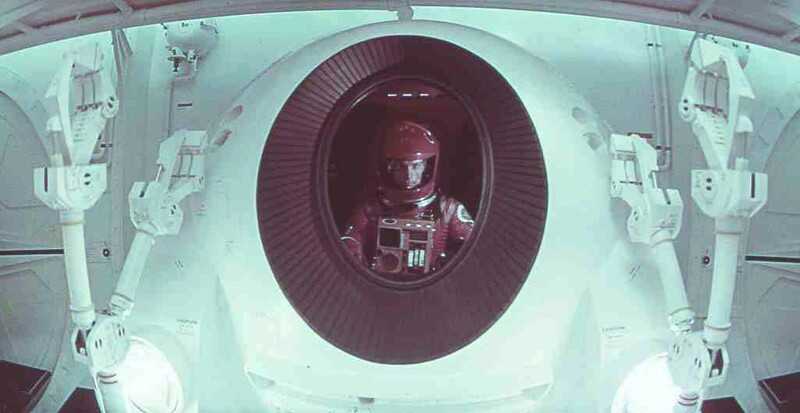 This is especially true with the interior of the pod, as many parts are not clearly visible in the film, and some parts do not even show up in fhe final cut of the film. I took the approach that, since the exterior is fairly well documented, the hardest part (from a completeness and accuracy standpoint) would be to make the interior. If I could not reproduce the interior to a level of accuracy that I would be happy with, then I was not going to do the project. Over the years, I have been collecting pictures and information in order to reproduce one of the Pods. In addition, I have recently determined what was used for a significant component inside the pod. I now believe I have enough information to make a good attempt at reproducing a full size pod. Also, several people have been encouraging me build a pod, so all of these factors have convinced me to go ahead with replicating the pod. However, there are still some areas of the pod interior that are not fully understood (seat area, inside of door, area immediately around the seat, and the foot-well area.) So I am still researching these areas. Most of the interior parts consist of flat control panels with lighted push button switches. These would be fairly easy to replicate. The most difficult items inside the pod to replicate are the hand controllers for the pod attitude and velocity control, the hand controls for the pod arms (some call these the Waldo controllers), and the explosive bolt arming unit. 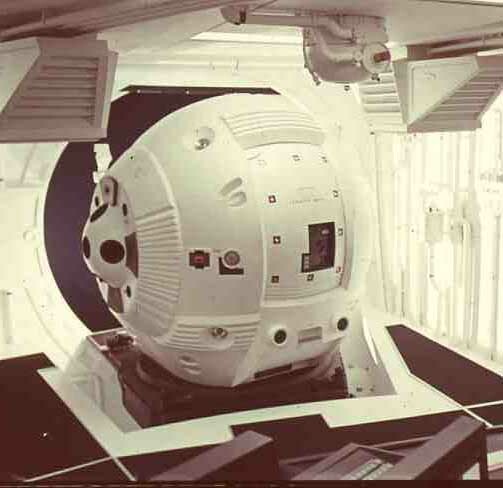 This section privides a discussion on the design of the pod as seen in the film. The upper part of the outside shell of the pod is basically spherical in shape and transitions into a multi-faceted bottom structure. Attitude control rocket engine clusters are attached on the left and right sides, with the main axial engine recessed into the underside of the vehicle. An oval window is recessed into the front wall with an egress hatch in the rear. Various details are positioned around the outside of the vehicle, such as cameras and hand holds for EVA (Extra Vehicular Activity). A highly detailed panel is located directly below the viewing window. 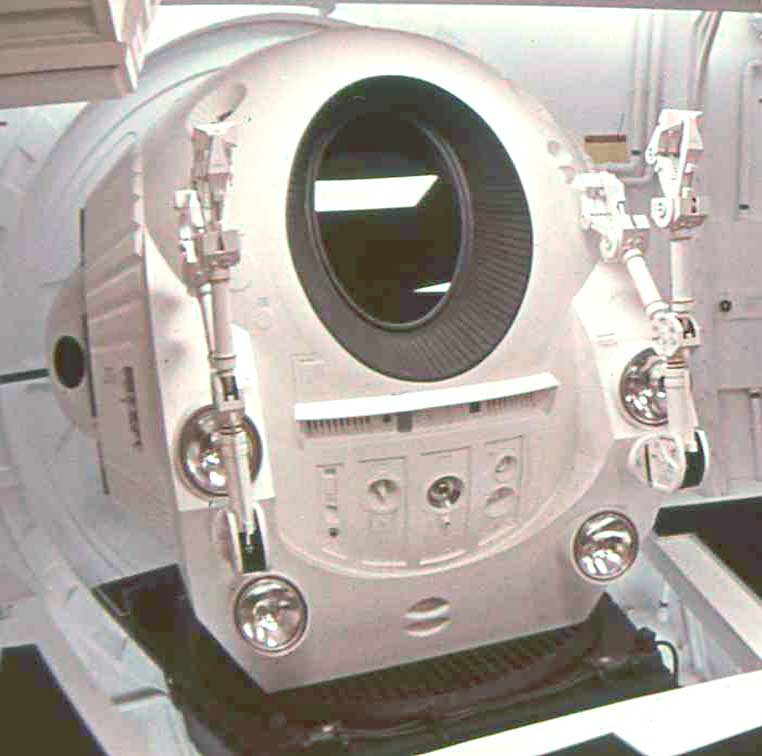 This panel difers between the pod in the pod bay and the separate EVA pod with the replacement of the front looking camera lens with the HAL lens. Recently, excellent observations by some members of the Pod Working Group Forum (see Links) have pointed out other differences in the front panel between the two pod versions. My approach is to make the EVA version. EVA Pod (top image) contains a HAL lens in place of the camera lens on the pod in the pod bay (bottom image). The 2001 pod was designed with the pilot located at or near the center of the spherical shell that makes up the pod. This was done so that he is able to reach all controls surrounding him. This point is key to understanding the layout and orientation of the control panels. The interior wall on the upper half of the pod is a spherical shell, which is a different shell (smaller diameter) than the outside spherical shell. 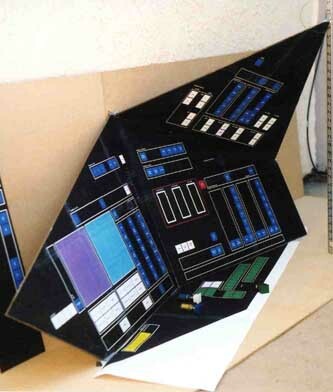 The control console panels are fitted within the inner shell, around the pilot on three sides. The overall layout of the pod interior is symmetric about the fore-aft centerline vertical plane, so that the left and right sides are primarily mirror images of each other. There are differences in the number and layout of switches on the panels, but the size and location of the panels are similar. The panels are mostly flat sheets with lighted buttons and flat panel display screens mounted in them. 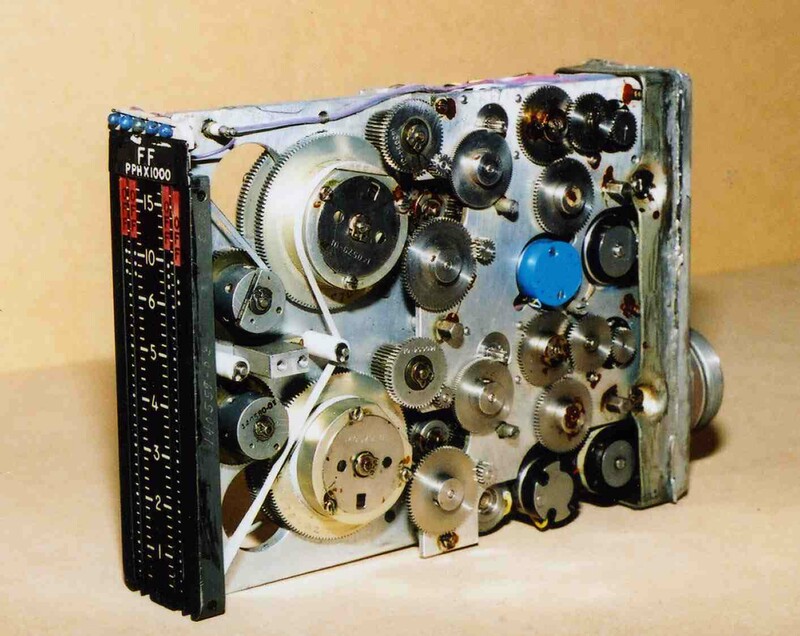 Two panels have vertical tape indicator instruments mounted in them, three on the pilot's right and 6 on the pilots left. The vertical tape instruments will be difficult to duplicate, especially if they are to be functional. More on this later. There are a total of 26 panels, most of them have controls or switches on them. At last count there were slightly under 500 lighted push button switches. This may vary by a few as more detatil on some of the internal items are uncovered, especially on the controls mounted to the door's inner surface. The center console panel of the pod contains two three-axis hand controllers for pod attitude and velocity control, and the two controls for the pod arms (some call these the Waldo controllers). 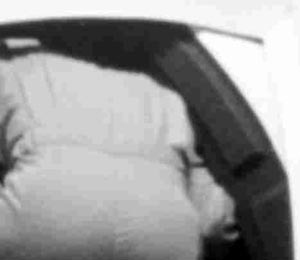 The panel over the pilot's right shoulder contains the device for arming the emergency hatch explosive bolts. A very short entry way leads from the door opening to the pod cabin. 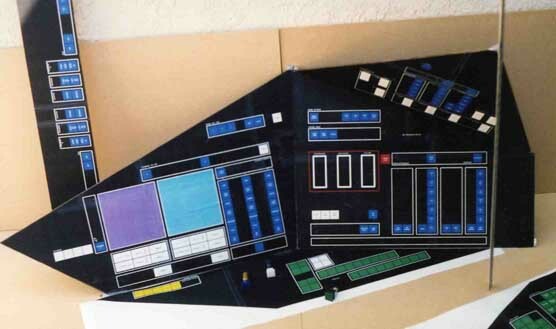 The sides of this entryway is padded in the same style as the command section of the Discovery, with separate padded panels mounted to the wall surface. There are three hand holds on the interior for assisting getting into the pod, one on each side of the padded entryway, and one overhead. The door of the pod is made of two sections; the door frame/structure, and the removable center hatch. When the door is opened it is motor driven to the right (as viewed from the rear exterior). 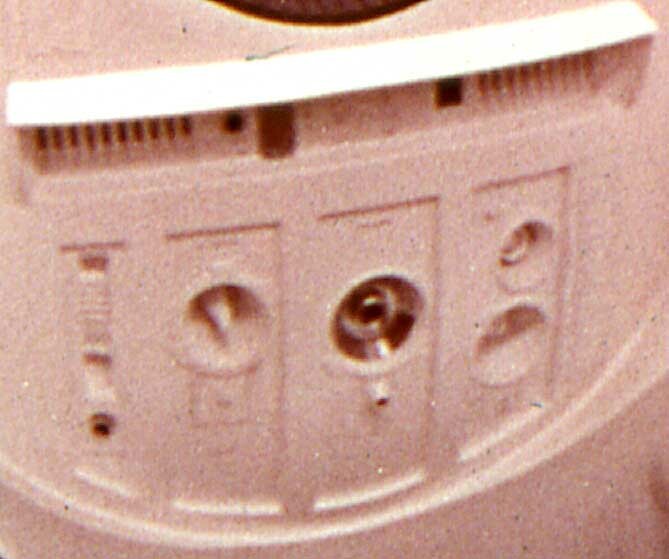 The door is pivoted at the top center of the pod (circular access cover, which covers up the pivot assy is visible on the top of the pod exterior) and the bottom door edge is driven along a track. 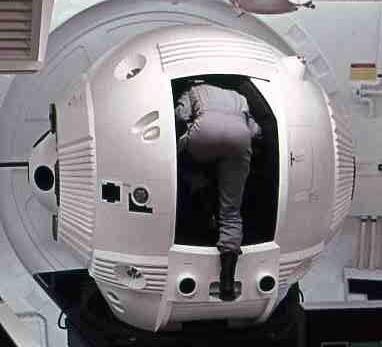 Since the door is inside the pod wall, it should move slightly outward at the end of its travel in the closed position to provide a seal with the wall. When the door is in the open position, the top left edge is visible protruding into the door way opening at an angle due to the pivot geometry. Enhanced images showing door thickness. Edge of door has rectangular protrusions that interlock into opposing doorway edge . The central portion of the door is removable (ie via explosive bolts) and is the same size as the doorway opening. 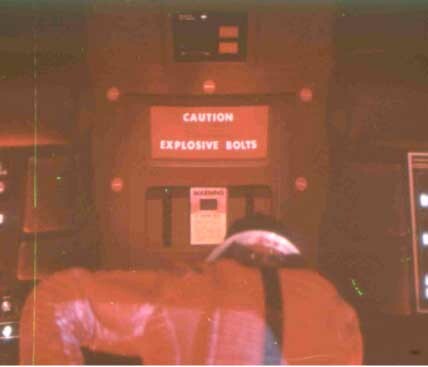 There are 10 explosive bolts located around the perimeter of the removable door hatch. Within the outside surface of the door hatch there is a recessed control panel. Currently the function of the control panel is unknown, but it most likely controlled external (manual) opening of the door or removal of the central hatch. Detail of the control panel on exterior of the door. The interior surface of the door also has several controls. These are presumably for triggering the explosive bolts, as perhaps, manual opening of the door. Whether the pod had a specific seat for the astronaut is a pont of uncertainity. Discussions on the Pod Forum (see Links) have alluded that the seat cushion visible in a photo known as the "Walker photo" was only there to provide comfort to the actor. This is supported by the fact images looking in through the door opening do not show any seat back. However, it is obvoious from the film that there is some sort of provisions for a seat belt, and the Walker photo does show two small clusters of lighted switches on either side of what would be the seat area. More photographic evidence is needed to clarify the seating arangement. 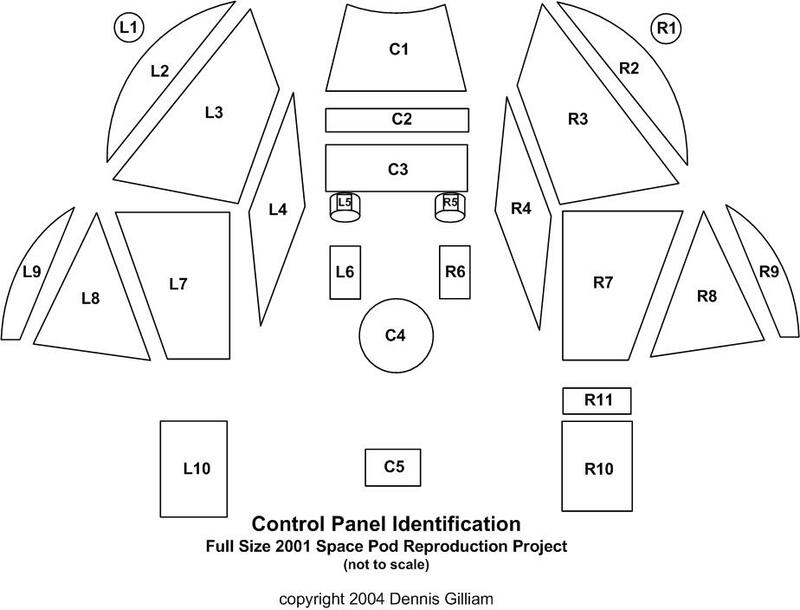 This section provides a discussion on the efforts to construct a full size reproduction of the 2001 one-man EVA space pod. A surviving blueprint of the "13 inch" pod model shows the height of the model to be 1 foot 1 and 1/2 inches. Scaling this up to full size (based on 1/6 th scale for the model) gives an outer diameter of 6 feet 9 inches. Early references (circa 1970) mention the size of the pod as about 7 feet. The 7 foot number could be a rounded-up value for the 6'-9" number. I will be using the 6'-9" number for the pod exterior diameter. While I have toyed with the idea of making the exterior out of aluminum, the easiest thing would be to make it out of fiberglas. Carbon fiber would be nice since it is lighter weight and stronger than conventional fiberglas, but I'll start with fiberglas since I have experience with it, and none with carbon fiber. While the exterior can be made monlithic, it would be beneficial to have the "ear muffs' removable, as well as certain panels. For maximum strength with minium weight, it is probably best to use an internal frame structure with which to mount the components. Aluminum is best since it is lighter than steel, but, it is more difficult (at least for me) to weld. As discussed above, the limiting factor on whether to do this project, is getting the interior correct. Thus, the near term focus of the reproduction project will be the pod interior. As mentioned previously the upper half of the interior wall is a spherical shell, which is inside the shell which makes up the outer surface of the pod. Currently the biggest task is determining the diameter of the interior wall. This is critical to moving ahead with the project. Since I haven't found any direct references to the interior diameter, I have been trying to infer the diameter. I have looked at he cord lengths of the control panels which intersect with the wall, but lack the perpendicular distant measurement to the tangential plane. Other methods I have tried were determining the wall thickness based on the recess depth of the front window, and based on the thickness of the door. I am narrowing in on a diameter that I feel is valid, however, more information would be helpful. Panels C2, R9, and L9 do not have any controls on them. Base panels/sub-structure panels are not shown. The console panels can be easily replicated since they are flat sheets, but the switch buttons require some work to replicate. The individual control panel layouts are nearly complete, and most of the labeling has been determined. Some details still need to be clarified and added in a few areas. However the overall layout of the larger panels are complete. The next task is to determmine the correct orientation of the panels (ie the angles with respect to each other). To determine the correct panel orientation, I made some full size color images from my drawings of the panels. I glued these sheets onto 1/8 inch tempered hardboard panels. Then I put them together and started measuring and verifying angles against interior images of the pod. I hope some of this will help shed some light on the diameter of the interior pod wall. Here are some images of the full size mock-up panels. These images are of the right side cluster of panels R3, R4, R7, and R8. The two semi-circular filler panels R2 and R9 are not in place. These panels are rough versions, and were used to "get a feel' of how the panels go together. They were simply laid out and taped together for this fit check. All of the panels shown here have a common error which has been corrected since these photos were taken. Finalized mock-up panels of the correct size are in work now, for both the left and right side consoles. 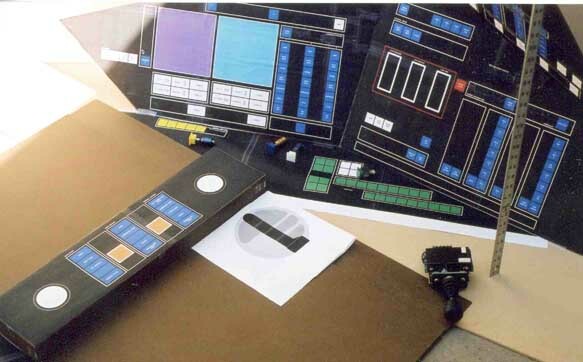 View looking aft, showing the central control panel C3 linking the side consoles together. The white circles are where the pod attitude and velocity control joysticks are located. Similar view as above, but looking forward, and a right hand side view. These images show the approximate location (but not orientation) of the pod arm controller behind panel C3. This was a useful exercise, and identified some problem areas. It was really usefull for getting more of the "feel" of how everything fits together than exact measurements. Since these photos were taken, the overall sizes and shapes of the panels have been adjusted. 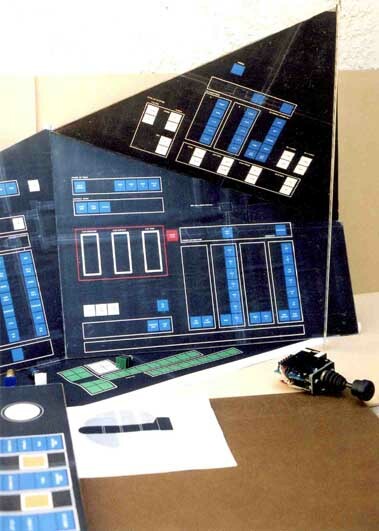 As indicated above, the next step will be to assemble the updated panel mock-ups into a more realistic configuration by elevating all panels up from the floor. This will require fabricating a simple framework to mount all the panels. Once the correct orientation is verified, the control panel drawings will be updated prior to cutting metal panels. The original lighted switch buttons appear to have been customized. Computer type push buttons of the time period do not match the button tops as used in the pod interior ( in both size and shape). The button tops are fairly large as switches go, but this actually makes sense as they have to be capable of being operated with space gloves on. The pod buttons all have a "T" shape button. There are two types of switch buttons; square and rectangular. The rectangular switches have 2 lights each. These don't match anything I have been able to find currently, or surplus switches from the 1960s. So I am custom building the switches and buttons. If necessary, I may have new switch buttons molded. I have modified some standard switches to achieve the same look as the pod switches with operating functionality. A sample of each switch button type is shown below. 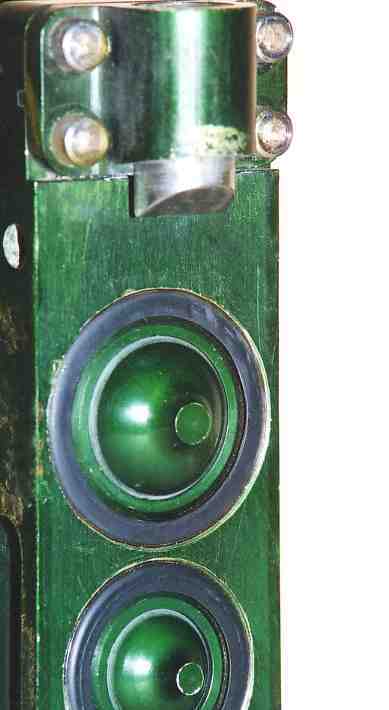 Lighted push button switches of each type (shape & color) as used in the pod. Unit on far left shows switches mounted on sub-panel. Overlaying control panel is not shown. Images from the film show the push button lighted switches appear to be sub-panel mounted. This means that instead of the switch being mounted on the control panel, that it is actually mounted on a panel attached to the underside of the control panel. This way there is no bezzel showing around each switch button, as the switch button passes through a square or rectangular hole cutout in the top control panel. 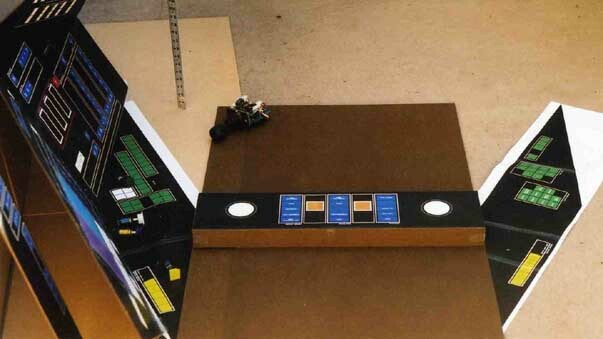 This will result in more work (ie twice the number of panels to make), and dictates the type of switches to use. The pod control panels contain 9 vertical tape indicator instruments. Instruments of this type were actually used in spacecraft such as the Gemini capsule. However, since there are no spare Gemini spacecraft laying around for me to scrap out the instruments, I had to take another approach. (I suppose any museum would get really pissed at me if I took to disassembling one of their spacecraft!) Fortunately, some aircraft also have vertical tape instruments, which can be found surplus, so they can be modified for use. Here are some images of a 4 channel vertical tape indicator that I will convert for use in the pod. 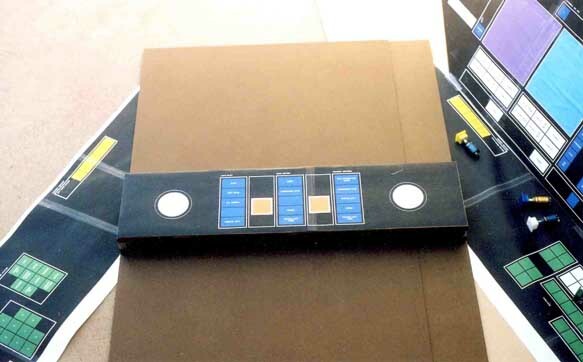 Four channel vertical tape meter with fixed scale. Instrument cover housing is removed. Moving (white) tape is visible as are synchros and feedback potentiometers with gear drive trains. Electrical connector is on rear of instrument. The interior of the unit is a maze of motors, feedback transducers, and drive gears. I will need to make a new face (scale) and design a servo driver to control the unit. More on this later. The Pod has two hand controllers for control of pod motion (attitude and velocity). There are distince left and right hand versions of the pod hand grips. These grips are attached to multi-axis controllers (joysticks) that provide at least 3 degrees of freedom/movement (fore-aft, left-right, and rotation about the vertical axis. I have acquired some 2-axis joystick controllers which will be converted into 3-axis units. The handle shaft will be modified to attach the pod hand control grip. 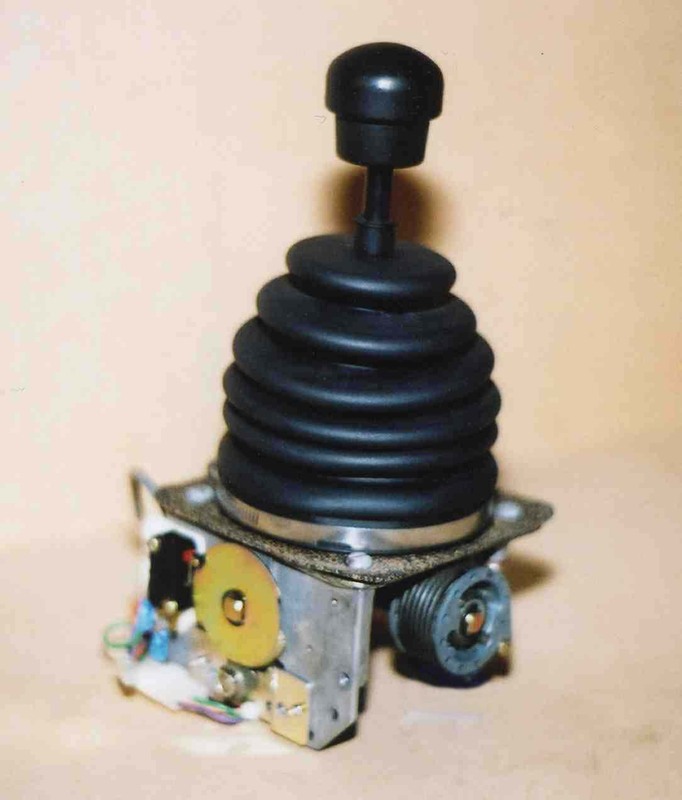 Example of the industrial 2-axis joystick controllers which will be modified into 3 axis units. Control shaft and bellows will be replaced with custom built unit to mount pod hand control grip. It is possible there may have been a 4th degree of freedom provided at the attachment joint between the joystick shaft and the hand control grip. There is what appears a pivot that would provide up/down motion of the grip with respect to the joystick shaft. However, not enough information on the functions and operation of the control grip is known to be certain. The control grip is oriented horizontally and the pilot's hand rests on it. There s a "dead man" switch on the top surface, which enables the control grip when the hand is placed on the grip. The index finger is separated from the rest of the fingers by a vertical guard ridge, which probably acts to align the pilot's hand on the control grip. The hand control grip provides each finger with a switch button, with the index finger switch on the upper portion of the grip and the switches for the other fingers on the lower portion. There may also be additional switches for the other fingers on the upper portion of the control grip, but photographic evidence is inconclusive as to whether these latter switches actually existed. There is also a thumb button, which is a different shape from the other buttons. While its function (as well as the other switches) is unknown, it could be used to enable/disable the forth degree of freedom pivot (but this is only a guess). One of these pod hand controllers is also used in the lunar bus, Aires, and Orion for each pilot, in addition to a vertical control grip. Several years ago, when working on the 2001 spacesuit restoration, I came across a photo of one of the vertical control grips on the Aires set. Using a magnifier to inspect the image, I noticed a small identification plate was attached to the base of the control grip, and I could see a part number. At that point I realized the the vertical control grip was a real piece of hardware, and a slightly modified version (with the base cut off) was used for the hand controller on the Discovery spacesuit chest pack. I was able to obtain several original control grips of this type for use on the spacesuit. 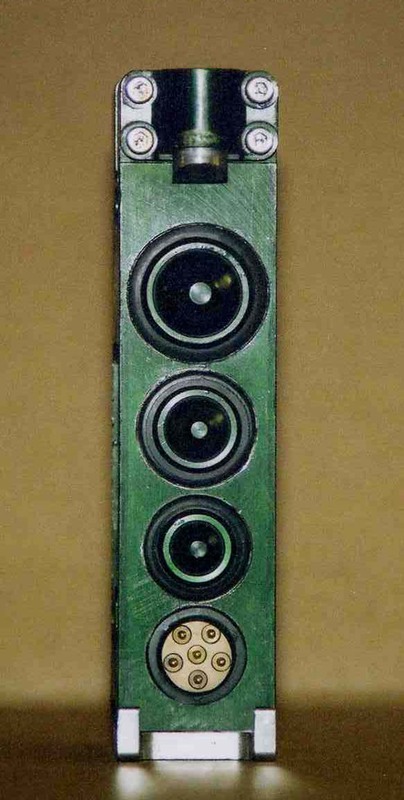 These vertical control grips were also used in the lunar bus, the Aires, and Orion cockpits. I thought the pod attitude hand controller could also be real hardware, but I have been unsuccessful in identifying it. There is some evidence it may have been something made for the film, but it is very well done and is constructed to match the design of "real" control grips. This true in the use of the unique texturized coating that is characteristic of British control grips. What is obvious is, there are left and right hand versions of them. I figured I could always make them from scratch if I had to, but it would be better if I could find originals, if they indeed exist. More about this later. The pod also has two hand controllers for controlling the pod arms. Each controller has two axes of movement (rotational and in/out). While it apears that some sort of control grip, or part of one, was used for the central grip handle, the metal barrel assemblies were custon made for the pods. Full scale drawings of these are nearly complete, and some construction has begun. More on this later. Besides the hand controllers, one of the more complicated parts for the pod interior was the explosive bolt arming unit. This would be a difficult item to reproduce as it is complicated with many parts. 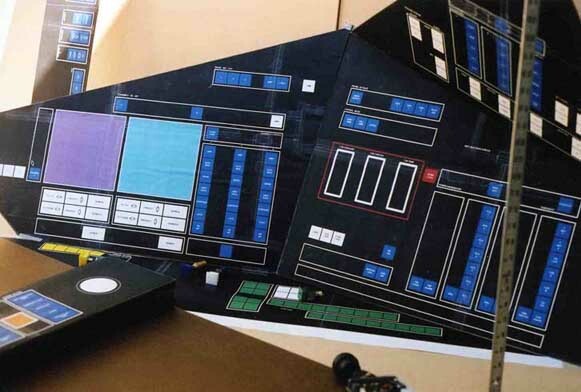 It is fairly clearly shown in the film, and again looks as though it is real hardware that was adapted for the film. Well, not too long ago while I was looking at some photos of the pod interior, I had a feeling like I had seen that device before. Some time later, it suddenly hit me as to what was used for the control unit. I then began looking for the correct version, and finally was successful in obtaining one of the units. Ths saved a lot of work and was the turning point for accelerating work on reproducing the pod. 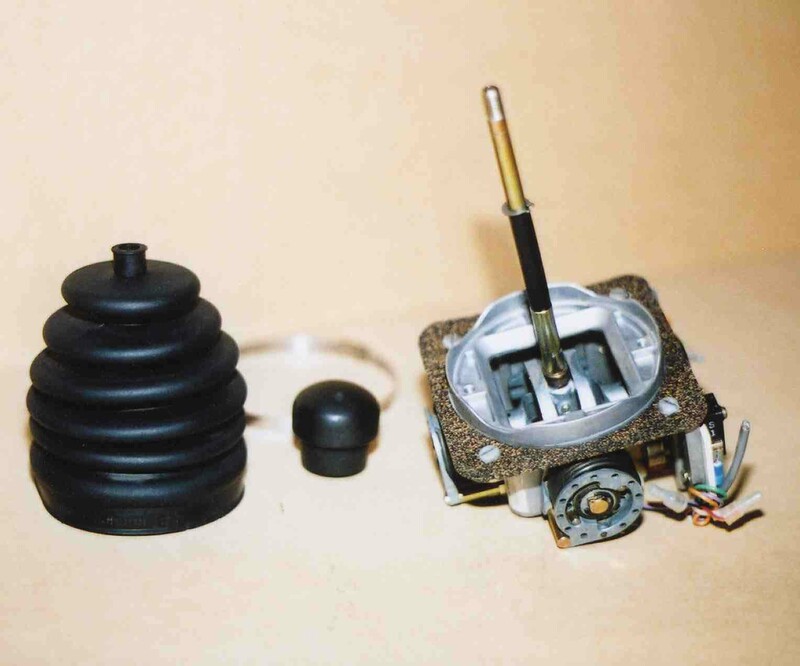 This is the same type of device as was modified for use as the explosive bolts arming control unit. Protective cover is removed. The unit has a protective cover whch comes off, revealing 3 firing switches. While the arming switches that Bowman pushes in the film look like balls, they actually are a slightly different shape with small stubs protruding in the center of the ball. They have the shape of a champaign glass bowl if the stem is broken off, leaving a short stub. Close-up showing detail of explosive bolt arming switch buttons. Once I saw this I checked the film again, and the stubs are actually visible, once you know what to look for. This is the kind of subtle detail you can only get by having the same equipment as was used to make the original pods. Some metal parts need to be machined and added to the removable cover to complete the unit per the film images. This is a difficult area since all of the door interior is not visible and what is visible is dimly lit. There are some controlls on the inside of the door surface which will need to be fabricated.